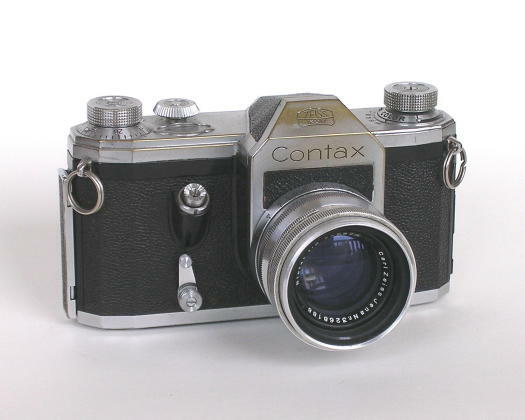 The first 35mm SLR with an eye level pentaprism viewfinder, the Contax S was developed in the harsh environment of postwar East Germany and first shown in the fall of 1949. I have a more wordy discussion of it here. 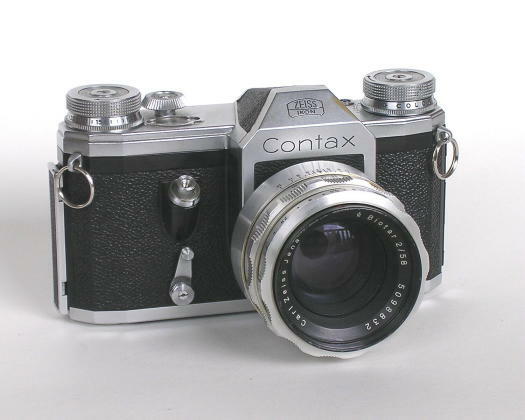 Over the years, the Contax S lost its name as it evolved and improved. 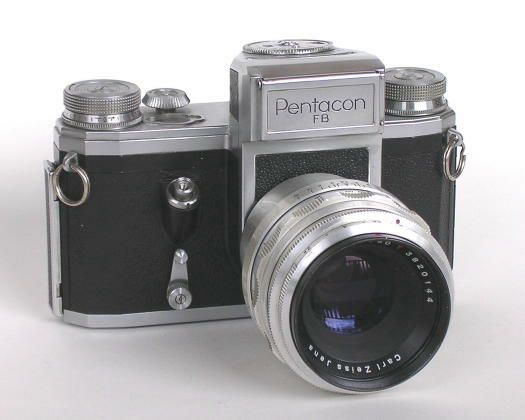 The final model was the Pentacon FB, which had a smoother and quieter shutter than the S and featured a top-mounted selenium light meter reminiscent of the Contax III. The lens shown here is the 80mm f/2.8 Tessar; it was not one of Jena's great triumphs. 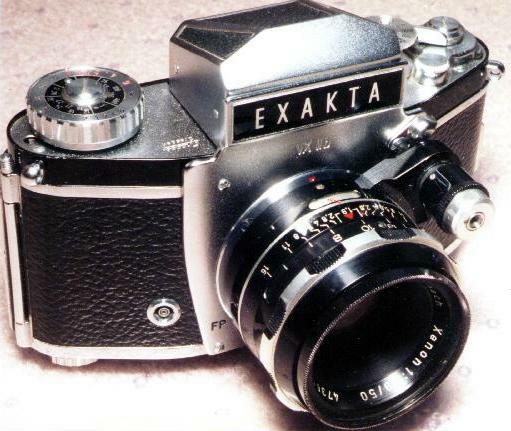 Hard on the heels of the Contax S, and from the same city, came the Exakta V: the first SLR with interchangeable waist-level and pentaprism finders and focusing screens. 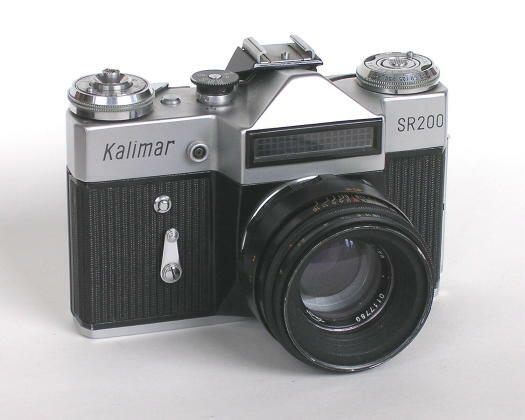 I apologize for the poor photo; this camera is no longer in my collection so I can't rephotograph it. 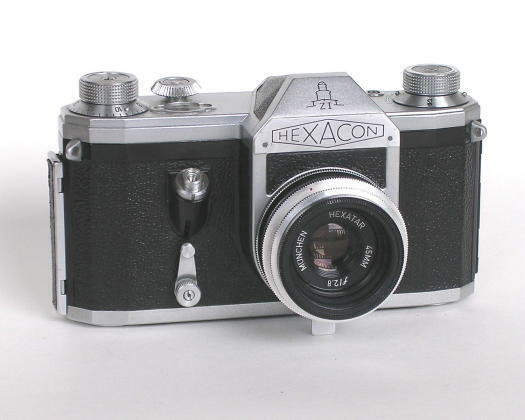 The Exakta VXIIa, a few years later than the V, had essentially the same specifications but a smoother shutter and slightly improved controls. I think it's the prettiest Exakta made. After the VXIIa came, logically enough, the VXIIb. This is the last Exakta based on the essentially-unchanged chassis of the original Kine Exakta of 1936. Somewhere in the process of trying to modernize its appearance, it lost some of its Old World charm. 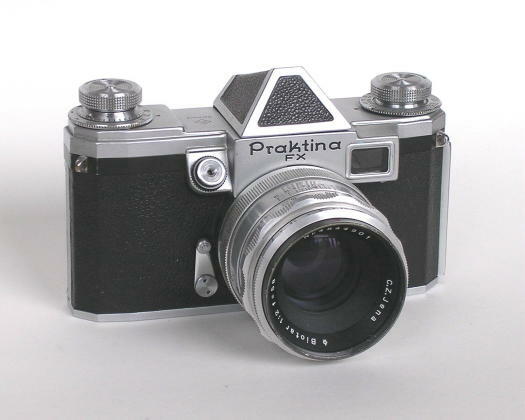 Also from Dresden came the Praktina FX. With interhcangeable screens and finders, internal lens automation and attachable motor drive, rapid advance lever and bulk film back, this represented the state of the art in the 1950s. Unfortunately it arrived not long before the Nikon F came along to change the rules of the game. 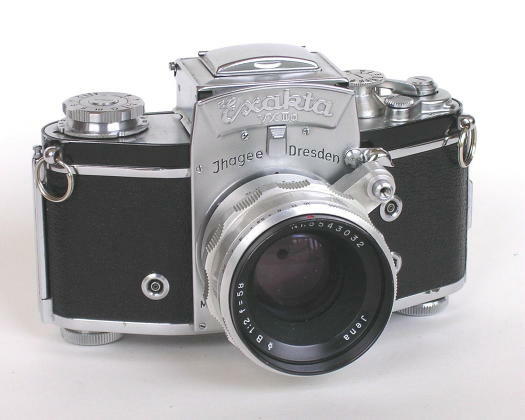 They were less active in the SLR field in West Germany, but there were some; notably the Zeiss Ikon Contaflex series, which introduced the concept of a leaf-shutter SLR in 1953. 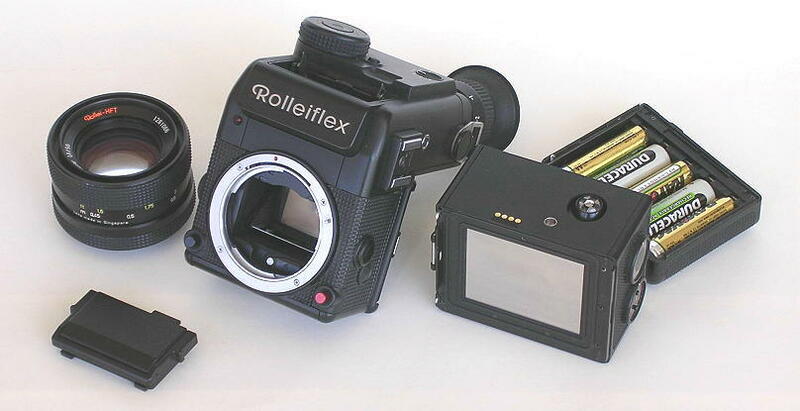 This Prima of 1959 was not the top of the line, but it shows much of what the Contaflex concept was capable of: interchangeable front components for moderate wide and tele lenses, coupled metering and (though you can't see it in the photo) interchangeable film backs. The 30mm Pantar you see mounted here was the widest lens available for any Contaflex. Once having started the trend, the West Germans seem to have become quite taken with the "leaf-shutter SLR" idea, and ran with it down alleys that might have been better left unexplored. 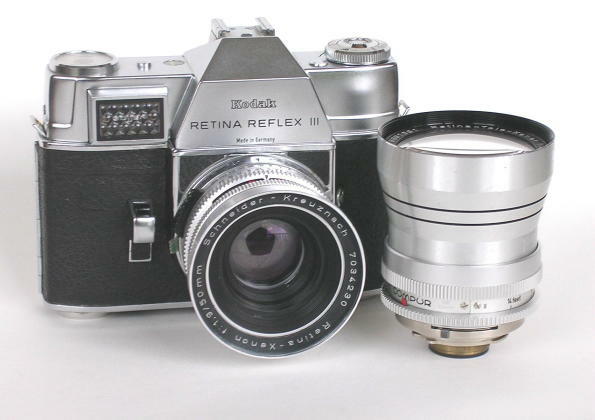 One of the first to join the rush was Kodak AG, with the Retina Reflex. 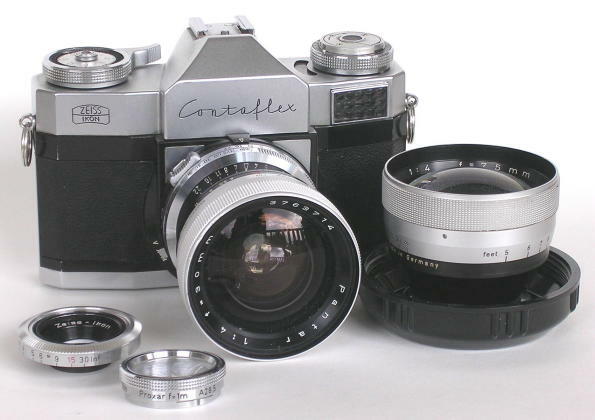 The first model had interchangeable front components like the Contaflex, but later models like this Reflex III had fully interchangeable lenses. There were still sacrifices to be made to the leaf shutter, though: that 135mm Tele-Xenar won't focus closer than 14 feet! 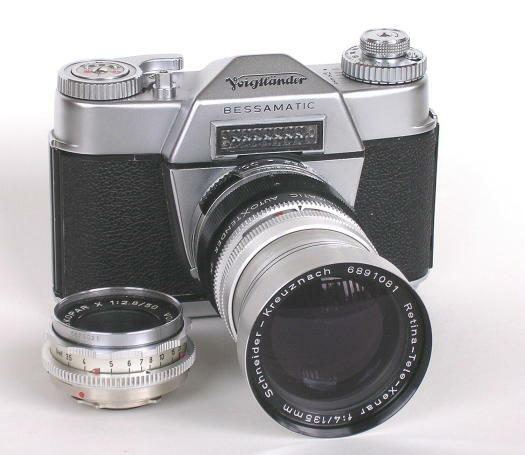 About contemporary with the Retina Reflex was the Voigtlander Bessamatic, which used the same shutter system. The lens mounts were so nearly identical that the 2x teleconverter in this photo works as a 2-way lens adapter between the two systems. The Bessamatic also gave the world its first still-camera zoom lens, the Voigtlander-Zoomar 36-82mm f/2.8 (that's a pretty impressive specification even today). 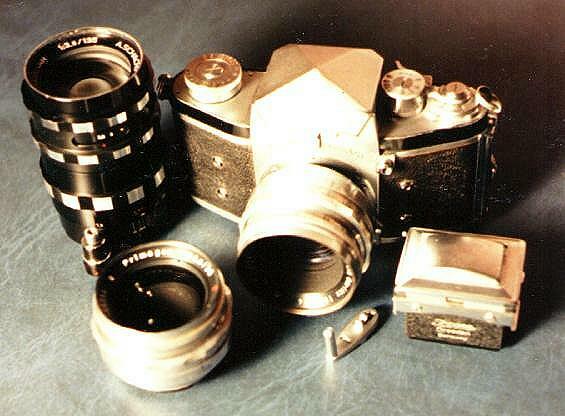 The Zenit has evolved through several generations. One of the most numerous began with the meterless Zenit B in the mid-1960s and eventually evolved to include first an uncoupled and later a TTL meter, lens diaphragm automation and all sorts of modern luxuries. Not the prettiest of cameras, these workmanlike Zenits are surprisingly smooth, quiet and solid and have a feel of quality beyond their appearance. 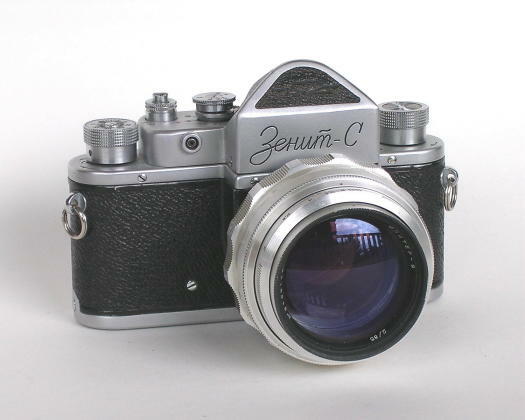 Pictured here is a Zenit E made for US export, with Kalimar markings and a lens graduated in feet instead of meters.